The board computer which had neither a power supply nor a keyboard released in 1976 was Apple I. 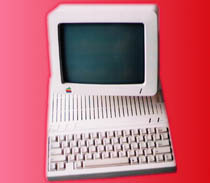 It is AppleII that it may be said that a computer made next in 1977 by Apple company is an opening of the personal computer which a keyboard, a power supply, interface to TV possessed for the first time. What is for it to become natural, but have done it commonly now || of Apple || if is terrible, is the time. By a permanent hit of this AppleII series, Apple Computer became big. It is a model of machines it grows whether production is already over, and to pass, but the person who still uses it is and sells software. The right is an Apple//c+9inch monitor representing splendor of a design of apple. Very unusual liquid crystal monitor stuck to Apple//c in those days. Personal computer AppleIII for the business that it missed this II series, and was called failure of apple company appeared. I had the time built-in that I entrusted it to extension with AppleII and raised clock speed and reinforced memory and was able to connect a HardDisk of Profile of 5MByte. I am considered to be failure on business, but a person using it is still because machine itself was not bad. Thus a flow of AppleII has not been over and strengthens graphic and sound, and it is made 16Bit which still and kept upward compatibility with AppleII with AppleIIGS changed into.